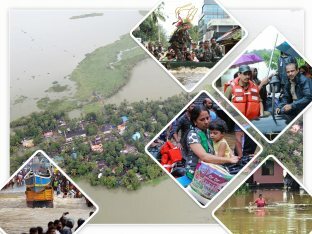 Also known as God’s own country, Kerala recently faced severe flooding in the month of August, 2018, due to unusually high rainfall which continued for days. According to reports, this was the worst flooding that the state has encountered in a century. All its 14 districts were on high alert and badly affected. According to Times of India report, over 10.40 lakh people were in living in relief camps, far away from their homes. People from all over the world have united to support Kerala with relief aids. So, we too had made an effort to collect a sum of money to contribute to the flood affected state. We have sent this amount to the CM Disaster relief fund of Kerala, hoping that it would help the victims in a much needed way. With the money and resources that is pouring from all over the world, the CM Pinarayi Vijayan is focusing on rebuilding the state and restoring the normalcy. But this is a gigantic task that cannot be done without our support. So, we ardently request everyone to extend their help in the form of donations in their capacity. Let us stand by our brothers & sisters.